This post was written by Hatchet reporter Morgan Baskin. Colonial Lodge No. 1821, a group of 55 Freemasons all with ties to the University opened its doors for a traditional Masonic ceremony at the Scottish Rite headquarters Thursday night in which nearly a dozen new officers were installed. The House of the Temple, the meeting space for the Colonial Lodge, is a century-old sprawling marble colossus outside of Dupont Circle, an historical anachronism down the street from a dry cleaners and pizza shop. Its ceremony hall was outfitted with a regal oak throne and floor-to-ceiling purple velvet draperies for the event. Sampogna, former president of GW’s Pi Kappa Alpha, said that Freemasonry today functionally serves as a community service-based fraternity. The Colonial Lodge formed in 2008, finishing its fifth year with alumni, faculty, staff and current students in its ranks. For some, the Lodge also provides a sense of fraternal brotherhood. Sophomore Nick Holy, who was installed as Marshal at the ceremony, said his parents were skeptical when he told them he was accepted into the Colonial Lodge instead of rushing a fraternity the fall of his freshman year. To apply for membership, applicants must be male and religious, former Worshipful Master and Class of 2007 alumnus Morgan Corr explained. Both requirements are rooted in centuries-old traditions, he added. Members then vote on applicants’ admittance after a series of interviews, and the vote must be unanimous among members. Sampogna added that the term “blackball” was coined by the original Freemasons. George Washington was a Freemason, as is former University President Stephen Joel Trachtenberg. The group’s D.C. presence secured them a cameo in a CBS Sunday Morning video about Freemasonry in the U.S. 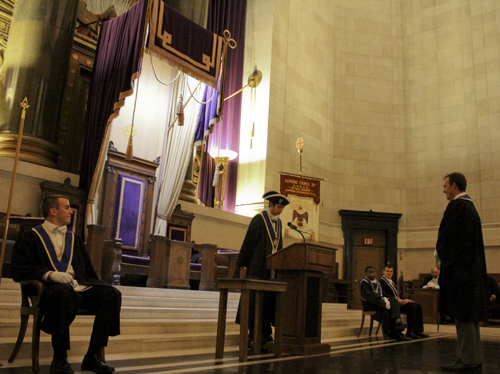 In the CBS interview, many members cited the “mystery” of the organization’s history and rituals, as well as its sense of tradition, as reasons for joining. But the group hopes the reality of Freemasonry and GW’s presence within it will be well represented through Gelman Library. The ceremony included a signing of a Memorandum of Understanding with Gelman Library and the University Archives to preserve the Lodge’s archival effects in the library. The group also pledged 10 percent of its annual funds to the library. The decision to commit to Freemasonry is a hefty and permanent one: Once a member is in, he is a member for life. But the group’s tenets of brotherhood and service continually draw men to join. “Death is, well, pretty much the end to your membership,” Sampogna said.